Ravioli have been around for centuries. Stuffed with meat, cheese, herbs and spices, the pasta shells would then be boiled and served with a red sauce, meat or marinara. The earliest known mention of ravioli appears in the writings of Francesco di Marco, a merchant of Prato in the 14th century. In Venice, the mid-14th-century manuscript Libro per cuoco offers ravioli of green herbs blanched and minced, mixed with beaten egg and fresh cheese, simmered in broth and seasoned with “sweet and strong spices”. In Tuscany, some of the earliest mentions of the dish come from the personal letters of Francesco di Marco Datini, a merchant of Prato in the 14th century. In Rome, ravioli were already well-known when Bartolomeo Scappi served them with boiled chicken to the papal conclave of 1549. Ravioli were also well known in 14th century England, appearing in the Anglo-Norman vellum manuscript Forme of Cury under the name of rauioles. Sicilian ravioli and Malta’s ravjul may thus be older than North Italian ones. Maltese ravjul are stuffed with irkotta, the locally produced sheep’s-milk ricotta, or with gbejna, the traditional fresh sheep’s-milk cheese. 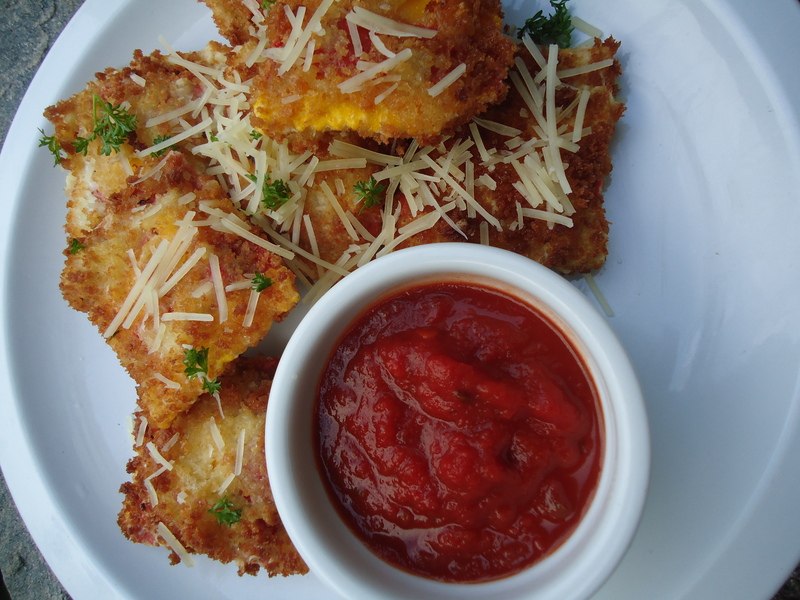 But the fried version, also known as toasted ravioli, at least in the U.S., appears to be St. Louis, Missouri original. While the origins are unclear, a few things are agreed upon that the most prevalent story is that the dish emerged in the late 1940s at a restaurant owned by Angelo Oldani, at what is now Charlie Gitto’s on the Hill, 5226 Shaw Avenue. Back then, it was known as Angelo’s (Oldani) Pasta House. 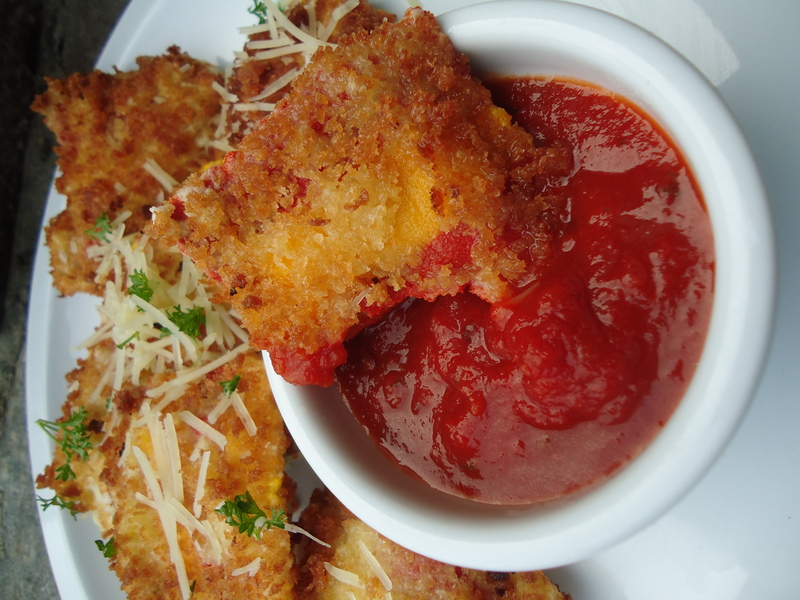 It appears that the toasted ravioli was the result of a mistake made by a non-Italian cook. A waiter told a cook to “drop some raviolis” for an order. The cook dropped the pasta squares into hot oil instead of boiling water. When the mistake was discovered, the cook plated the raviolis for the kitchen help to eat. Everyone loved the little “fried pillows, ” and the dish was served first as bar food and then added to the main menu. Unlike Buffalo’s hot chicken wings, or Nathan’s Coney Island Hot Dogs, the dish has not developed a national following. But in any event, if you can’t make it Charlie Gitto’s in St. Louis, you can certainly enjoy them at home with this simple recipe. It is a great little late night snack…….and trust me, you will not be able to get enough of these crispy pillows of heaven! For this recipe, I used some left over Shrimp and Lobster Ravioli that I made this winter and froze them for a future use, so I used them straight from the freezer. Nothing ever goes to waste in a cook’s kitchen! Enjoy! For the Marinara Sauce: In a food processor or blender place Italian tomatoes, tomato paste, chopped parsley, minced garlic, oregano, salt, and pepper. Blend until smooth. In a large skillet over medium heat saute the finely chopped onion in olive oil for 2 minutes. Add the blended tomato sauce and white wine. Simmer for 30 minutes, stirring occasionally. the marinara sauce can be made up a day ahead of time, cooled and stored,covered in the refrigerator until ready for use. Rewarm over medium heat before using. For the Ravioli: Heat the oil in a medium pot over medium-high heat until it reaches 400 degrees F.
Set up the breading station. Place the flour in a separate dish. Whisk together the eggs and the milk in a dish. 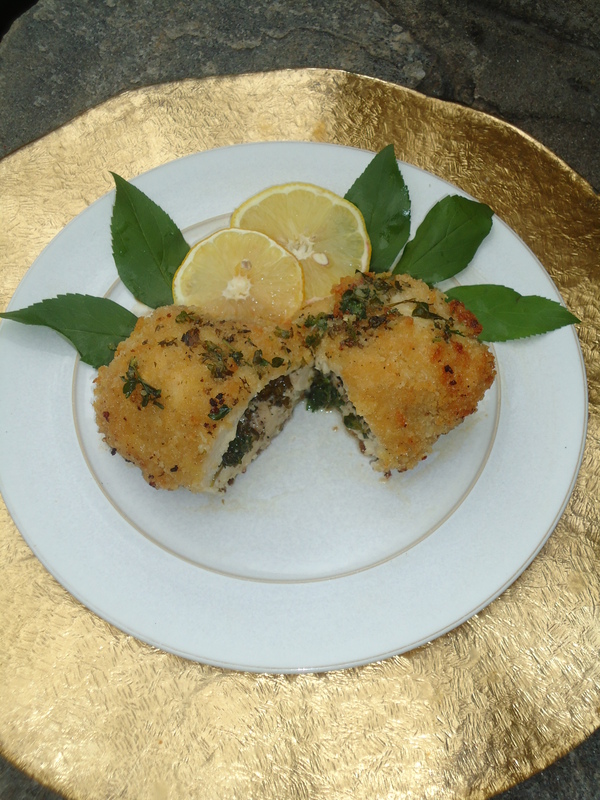 Pour the breadcrumbs into a third dish and add the basil, oregano, garlic powder and salt and thoroughly mix. Retrieve the ravioli from the freezer. One at a time, drop the ravioli into flour, shaking off the excess, then dip in the egg mixture, then dredge them in flour again, and then dip them once again in the egg mixture, coat them in the seasoned breadcrumbs. Set them aside on a parchment lined baking sheet as you go. When the oil reached the correct temperature, carefully add 2 or 3 at a time, the breaded ravioli into the oil and fry them for 25 seconds, until the surface is golden brown and the filling is hot and the ravioli floats to the top of the frying oil. Remove them to a paper towel and repeat with the rest of the ravioli in batches. Allow the oil to come back to temperature between batches. Transfer the cooked ravioli to a serving platter, sprinkle on the Parmesan and parsley, and serve with the marinara sauce.